There are many reasons you want to switch off your WiFi at night. Some people worry about the prolonged exposure EMF radiation during their sleeping hours. Others are concerned about the security risks of keeping it on all time. Still others believe that turning off your router at night extends its lifespan. But one thing is for sure: turning WiFi off when you are not using it saves electricity. After all, when you are not using it, why keep it on? Open the router management page. Go to the Wireless Settings page. On the Wireless Settings page, click the button “Edit WiFi Calendar”. In the popup dialog, select limited time, then enter time ranges to turn WiFi on for each day. 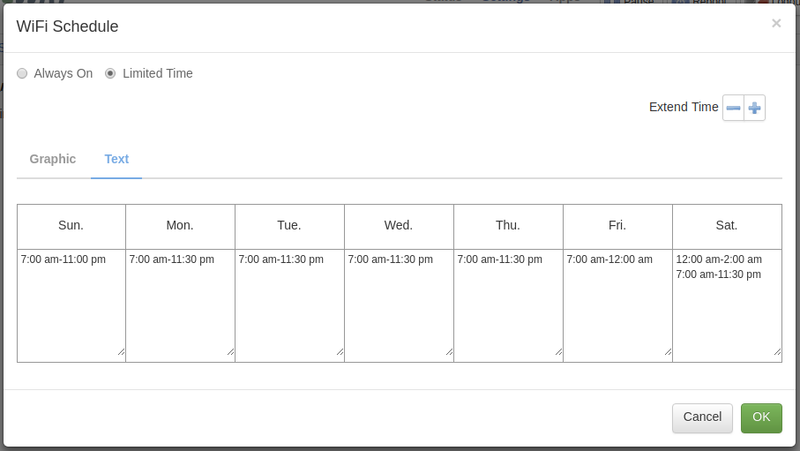 Notice that you can enter multiple time ranges within a day. In the screenshot below, the first time slot on Saturday (“12:00 am – 2:00 am”) effectively keeps WiFi on till 2:00am on Friday night. Click OK to dismiss the dialog, then click Save to save Wireless Settings. What if you temporarily need WiFi beyond the scheduled cut off time? You can click the +/- buttons on the right of the WiFi schedule dialog to extend WiFi time one-time only. What if WiFi is already turned off by schedule but you need to turn it back on momentarily? Well, normally you’ll need to connect a computer to the router by wire and extend WiFi time. But there’s an easier route with the pcWRT router: enable remote control in Cloud Settings and use your smart phone’s mobile connection to extend the router’s WiFi time.